We all have radical ideas that we'd like to see implemented: the all-reliever pitching staff, the perfectly optimized lineup, the corner outfielders swapping based on batter handedness, etc. Until somebody puts them into play, they're just ideas. What Charlie Finley did, then, was a favor to us all: He took one of those ideas and put it in play. And when it failed, we got to move on. We never had to talk about it again. For once, a crazy idea tried, tested, and settled. But things change. Even settled matters eventually become unsettled. So, as we approach the 40th anniversary of Herb Washington's major-league debut, it's worth wondering whether the question of whether a world-class sprinter can justify a roster spot is still resolved. Background: Washington was a world-class sprinter who held records in the 50- and 60-yard dash. Finley signed him to be a pinch-runner. He never held a bat or glove but pinch-ran for the A's for a bit more than a year. It wasn't particularly successful for a number of reasons, but the most notable one is this: He wasn't very good at baserunning. He was about a half-run or a run worse than average, according to our metrics and those at Baseball-Reference. The fourth-place finisher in the 2012 Olympics would have been the world record holder as recently as 15 years ago, completing the race in 98.4 percent of the time it took the world record holder from Washington's era. 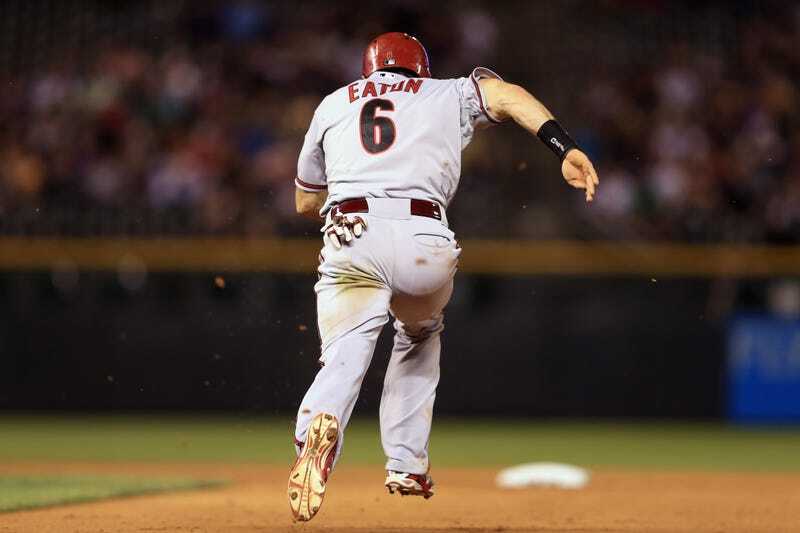 In other words: The environment to steal a base has remained constant, or mostly constant, while the baserunner himself has become faster: one percent faster, perhaps, or two percent, or if we can imagine Usain Bolt in a Rays jersey, nearly four percent faster. So would today's world-class sprinter be too fast for defenses to handle? To answer that, we need to know two things: How much faster world-class sprinters are than Billy Hamilton, and how much faster Hamilton would need to be to be invincible. *There are more than six, of course, but the other factors are small or unmeasurable: Umpires' tendency to call runners safe or out; playing surfaces; wearing longer pants; pickoff moves; and so on. The factor you might think should be mentioned is speed of pitches, which gets the ball to the plate faster. But the difference between 90 and 93 mph is about two-hundredths of a second, and might conceivably require pitchers to take longer to the plate (to generate that velocity) or make it correspondingly difficult for catchers to handle pitches. But you can keep that in mind as we go if you wish. Inches away from the bag, not clear whether he has been tagged; probably. Maybe a foot away from the bag. Doesn't appear to have been tagged. Maybe a meter from the bag. Defender has caught ball but hasn't had time to apply a tag. Hamilton has been caught once in the majors. If he was one percent faster, he might have been safe that one time; it's really, really hard to say. If he was two percent faster, he probably would have been safe. If he was four percent faster, he'd most definitely have been safe. The margins between a stolen base and an out are very small, and were presumably small when Herb Washington was the runner, too. A small improvement in speed (like the improvement from Herb Washington to today's sprinters) might make a big difference. "I'm a competitor so I'm going to say I could beat him," (Hamilton) told the New York Times' Robert Weintraub when asked how he's thought he do against (Usain Bolt). But maybe we already know how a world-class sprinter would do as a baserunner. Maybe Billy Hamilton is as fast as a world-class sprinter, and maybe he has already shown us the outer limits of what a baserunner could do. I think the answer to the first part of that sentence is "no." But the answer to the second part is more ambiguous. There's a bit of irony when it comes to speed: It is the most measurable tool, literally determined to the hundredth of an inch by precise instruments, and yet we don't really have the quantitative way to answer the question "How fast is Billy Hamilton?" As Albert Chen wrote in Sports Illustrated, "No one seems to know precisely how fast Hamilton is—not even the Reds, who drafted him." Anytime we've seen him run, it's been on a baseball field, in baseball shoes, doing baseball things, which generally entail secondary tasks: swinging and discarding a bat, or tracking a fly ball, or rounding bases, or preparing to slide, or assessing a pitcher's move. Meanwhile, we've never seen Usain Bolt turn a corner or wear a helmet. So this is going to require some triangulation to answer. The 60. In a number of online forums, he's reported to have run a 60-yard dash in 6.5 seconds. Further, a number of other prospects' 60-yard dash times are said to be similar to Hamilton's when they are around 6.5 seconds. This would be tremendously valuable information, as Washington raced in the 60 (in a world record 5.8 seconds, though obviously not in baseball spikes). Further, because the 60 is baseball's "official" timing length, like the 40 is for football, countless baseball players have recorded 60-yard times to compare against. Alas, though, there's no origin for the time, and Sports Illustrated's Chen wrote in late 2012 that "he's never been timed in the 60-yard dash." "Billy Hamilton can't remember ever running on a track, so he has no idea what his time in the 100 meters would be. There was a day, he said, that he was asked to run a 40-yard dash at a football camp in Mississippi. 'I ran a 4.5 flat,' he recalled Thursday evening. 'I was in the ninth grade.' That's a respectable time for NFL running backs. But that was six years ago and Hamilton, 21, is faster now." To put 4.5 seconds in context: Darrell Green, an Olympic sprinter turned NFL Fastest Man, claimed his fastest 40 was 4.15 seconds. That was three decades ago. The fastest NFL combine time since electronic timing began was 4.24 seconds, by Rondel Melendez. For various reasons, it's hard to do much with this 4.5 time. We can't really trust the validity of it; it was conducted, presumably, by a high school coach recording by hand, unofficially, and it is being recounted by Hamilton himself many years later. And, of course, he was 15. Who knows how much faster he is or isn't now. But, taken at face value, it puts him among the fastest athletes but not particularly close to the fastest sprinters. I played 6 seasons in the minors...ran 13.1 around the bases and my best 100m was 11.29. Ran the 60 in 6.56, 40y in 4.56. So, Hamilton's time is soft. He can go faster...may not have been trying. The key section here—if you believe a single word of it, at least—is that this guy's best 100 meter time was 11.29. We know, empirically, that 13.1 is extremely fast, and that Hamilton hasn't demonstrated he can beat that. So, again, assuming there is any credibility to this post at all, we would conclude that this guy is in the same upper-echelon, 80-plus range that Hamilton is, and yet when running alongside true sprinters he's significantly slower. In the world where this guy is a reliable witness, Olympic sprinters are much faster than elite baseball runners. Wow. Another guy from another sport who says he can beat Bolt. Chris Johnson (of the NFL) actually was a state high school champion in a strong sprint state, Florida, but his personal bests are about 1 second slower (than Bolt) in the 100. Another poster corrects him, noting that Johnson finished second in the state—behind actual Olympic sprinter Walter Dix, "with Dix running 10.38 to Johnson's 10.66. Basically Dix destroyed him. Granted Walter Dix is an Olympic medalist, so there's no shame in that…but then again Bolt destroys Dix whenever they race, so how would Johnson fare against Bolt?" Is any of this conclusive? Not even close. The times are unreliable in some cases, the methods of timing change in others, the runners are different ages, the stakes are different, the witnesses are anonymous message boarders, and even when we see a direct, head-to-head race on film our conclusions are open to subjectivity. Maybe you watched that race and think, hey, Vince keeps up with Willie for the first part of the race—and, of course, the 30 yards from first base to second would constitute only the first part of a 100-meter race. So you might have drawn a totally different conclusion from this section than I did. But my conclusion is this: It seems most likely the case that world-class sprinters are considerably faster than Billy Hamilton, at least in a general, non-baseball context. I don't even think Hamilton would dispute this. That quote at the beginning of this section—he gives away his actual opinion. "I could beat him," he says, but only after caveating it with "I'm a competitor, so...", which might as well be "I'm going to say this no matter what the truth really is." So by my way of looking at things—and your way might reasonably be different, even after reading these same "facts"—we've established two things: In today's game, the margin between a stolen base and a caught stealing for elite baseball runners is very small; and the difference between an elite runner and an elite baseball runner is relatively large. This should be enough to reopen Finley's case, but the real problem with Herb Washington remains unchanged. It's obvious, and everybody anticipated it then, and you've anticipated it here: Baserunning is more than just speed. April/May 1975: 13 appearances, two stolen bases, once caught stealing. He was out trying to score from second on a bunt in one game. The next game he was thrown out trying to go to third on a single. A few days later, thrown out at home trying to score from second on a single. Then picked off the next game. He didn't attempt a steal in his final nine games. Further, even when things were going well—as in early September 1974, when the LA Times ran an article headlined "This Finley Folly Is A Steal," with the wonderfully too-early line "but the laughter was premature. Finley is having the last laugh"—the team hated the experiment. Multiple players criticized it and pouted when they were pinch-run for late in games. "They accused Finley of wasting a place on the roster and Dark of misusing his runner," Ross Newhan wrote in 1974. Team captain Sal Bando blamed his miscues on "inexperience and nervousness." Reggie Jackson spoke kindly of him, but said "he does not know baseball like most of us." Bando, upon Washington's release: "I'd feel sorry for him if he were a player." And in the "Finley Folly A Steal" article, Washington himself seems to know he's running a thin line. "I thought stealing bases would be easy. I had little knowledge of what it entails to steal a base. It's a science and I'm still learning. I still have trouble judging whether a ball will be caught and I don't always get a good jump." Sports Illustrated wrote that the rap on him was "he can run but he can't slide." The local media ripped him when he missed signs. Teams would take advantage of his inexperience by beating him with pickoff moves or pitchouts. And, as we talked about when considering what Hamilton's value would be as a pinch-runner in 2012, you have to be almost perfect to make this worthwhile. If a pinch-runner stole second every single time he could and was used almost every game and was never caught, he'd be worth about a quarter of a win per month. That's valuable, and that guy probably keeps a roster spot. But start shaving it down, to even 90 percent, and it's about a one-win player. Is that worth the headache, the roster spot, and the cost of all those starters you'd be taking out of the lineup for the rest of the game? Ehhh. It really needs to be a guy who can steal every time and never get caught. We're assuming that a sprinter today would be considerably faster than Washington. Washington was noted for his quick starts, which was why he was so good at the 50- and 60-yard races. Bolt, who sets the standard for modern runners, is noted for his relatively slow buildup but incredible peak speed. It's not necessarily a certainty that he'd be faster than Washington from first to second. Though this guy claims that Bolt's splits at 40 and 50 meters are about three percent faster than Carl Lewis' were, so maybe the premise is fine. A lot of this conversation has been about margins, about small margins. The tiny margin separating Billy Hamilton from Usain Bolt, and how big it really is. The tiny margin between safe and out, and how big it really is. But the margin between success and failure for Finley's experiment was so slim, too. He had an idea that everybody laughed at. It almost worked. It failed, disastrously, but Washington's career WARP was 0.0. It wasn't -20.0. He was maybe the fifth-worst player on his team, WARPwise. The margins between success and failure are slim, and therefore it's hard to say how this hypothetical situation would work out considering all the unknowns. But, answering the questions that we started with: I'd expect a sprinter today to be faster than Washington. I'd expect that sprinter to be considerably faster than Hamilton in a non-baseball context. And I'd expect that if Hamilton were, say, five percent faster, he would be almost literally unstoppable once he reached base. There are certain things baseball can't change, and 90 feet is one of them. As humans get faster, eventually one of them will crack 90 feet. Ninety feet simply won't be far enough. I don't know what happens then. But I'm not convinced that the faster runner would be faster to second. 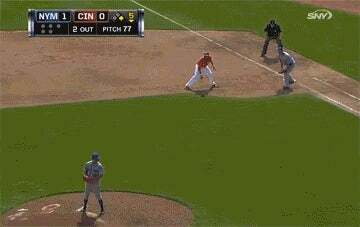 Think back to the anatomy of the Billy Hamilton caught stealing. If he were, say, five percent faster, he'd get there five frames sooner. But those frames are just as easy to add back in at the front of the sequence, when the pitcher makes his move: Does the modern Herb Washington take off two frames slower? We're talking about six-hundredths of a second! Does he take a lead that's one step smaller? That's a frame. Does he slide a bit less efficiently? Does that add one frame, two, three? Further: does the certainty that the runner is going—not even the certainty we see with Hamilton, but the absolute certainty that comes from inserting a runner whose only job is to steal a base—make it easier for the pitcher to shave a couple frames off his delivery, or the catcher to call for pitches that shave a couple frames off his pop time? Start adding these frames up, and it starts to seem like our hypothetical Usain Bolt would need to be not just considerably butconsiderably faster than Hamilton to kill-screen 90 feet. So, yeah, I think some team would totally be justified revisiting Finley's experiment. But I wouldn't expect it to work, not yet. Thanks to David for inspiring this with an Effectively Wild listener email.